As a physician, I understand the need for medical research. What I can’t understand is why we persist in using animals. Researchers use every kind of species in the now recognized mistaken belief that what holds true for them holds true for humans. Some, like mice, are used primarily because they’re inexpensive and easy to handle. None are used with true consideration for their suffering. A prime example is the rabbit. Bunnies are generally silent with unchanging facial expressions, so it’s easy for researchers to be unaware of their distress and avoid possible pangs of conscience over what they’re doing to them. People think their silence makes them unreadable but bunnies communicate constantly. I’ve recently become a bunny parent. After having had primarily dogs and cats, I had no idea what to expect. There was no barking, meowing, whining, whimpering, tail wagging or purring. From hours of interaction I’ve learned bunnies do make their feelings clearly known. They stamp their feet when upset or sensing danger. They make a quiet grunt when angry and an extremely soft grinding noise when happy. None of these messages could possibly be heard over the noise of a lab, but bunnies also use their bodies and ears to communicate. They hunch up when scared and totally flatten out when relaxed. Their ears pull back, eyes widen, and noses twitch rapidly when scared. Their ears stand up straight, eyes relax, and breathing slows to gentle nose wiggles when content. They literally leap for joy when extremely happy and run and hide in a flash when scared. 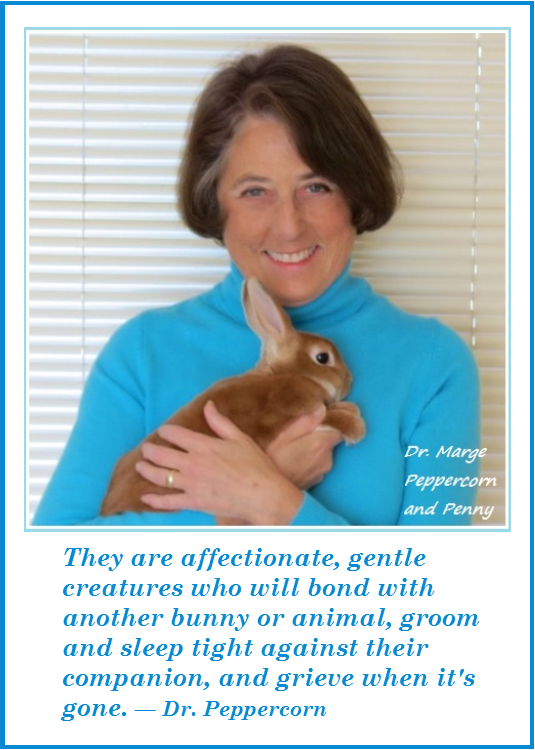 They are affectionate, gentle creatures who will bond with another bunny or animal, groom and sleep tight against their companion, and grieve when it’s gone. All these behaviors go generally unseen or considered unimportant by the average researcher who sees the rabbit as an inexpensive and uncomplaining test tube. What makes using rabbits even more upsetting is that as a genetically hard wired prey animal they hide feeling weak or sick, therefore making it difficult for researchers to recognize their suffering. As genetic prey animals, they are easily terrified. Even rabbits living for years in a loving home that they should know is a caring environment get terrified by loud noises and require soft voices and gentle handling.